This item has been discontinued. Official updated list of procedure codes and guidelines published by the American Medical Association (AMA). Inclusive CPT book contains more than 8,000 five-digit CPT codes that designate provider-performed procedures and services. Official source for procedure coding and guidelines in 2018. AMA has discontinued the CPT Standard. If you're looking for an alternative AMA CPT book, we recommend the CPT Professional. You can also browse our entire selection of other titles in the CPT section. Please Note: AMA has discontinued the CPT Standard for 2019. 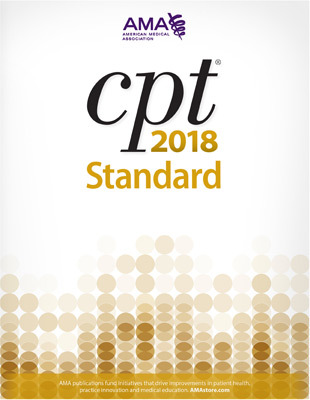 The CPT® 2018 Standard code book helps professionals remain compliant with annual Current Procedural Terminology code set changes. This is the AMA's official coding resource for procedural coding, rules and guidelines, which can help readers perform accurate claims submissions. The CPT® Standard code book contains the the latest codes, plus the official coding rules and guidelines developed by the CPT® Editorial Panel to help coding professionals submit accurate procedural claims.